Instead of jumping between tools and scrambling to bring it all together, see all of your projects and repositories in one simple, intuitive interface. With simple, merge request code review, Kanban boards, and Wikis, collaborating across single or multi-repo projects has never been easier. Helix TeamHub offers side-by-side diffs, commit history, code browsing, code comparison, code search, highlighting, and much more. With support for single sign-on (SSO), Active Directory nested groups, and self-service project administration, your project admins can quickly add users and set fine-grained permissions — without waiting for IT. 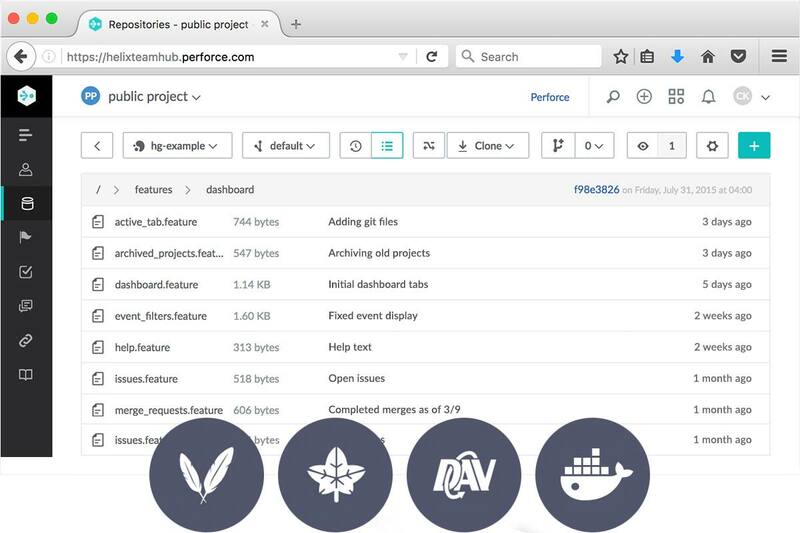 Manage your build artifacts with source code under one platform. Helix TeamHub supports Maven and Ivy build artifact repositories, Docker container registries and more to come! Already using Jira, Slack, or Jenkins? Helix TeamHub integrates with over 75 of the most popular developer tools. Our out-of-the-box integration with Jenkins provides a streamlined CI/CD platform to automate and manage your product release cycles. Spinning up your TeamHub account takes only seconds on our cloud. For large teams, Helix TeamHub Enterprise is your on-premise option for satisfying compliance or security requirements. Commenting on code changes line by line. Highlighting specific issues to team members with @mentions. Mark a Git code review comment as a task that the author has to address before the changes can be merged. Project admins can set up feature-branch workflows and quality gates to block changes that are not approved by team members. Administrators can also define default reviewers or default reviewer groups, set the number of reviews required, and require a successful build result before changes can be merged. And if the acceptance checklist is stalling progress, admins can force merge the changes regardless of what state the review is in. 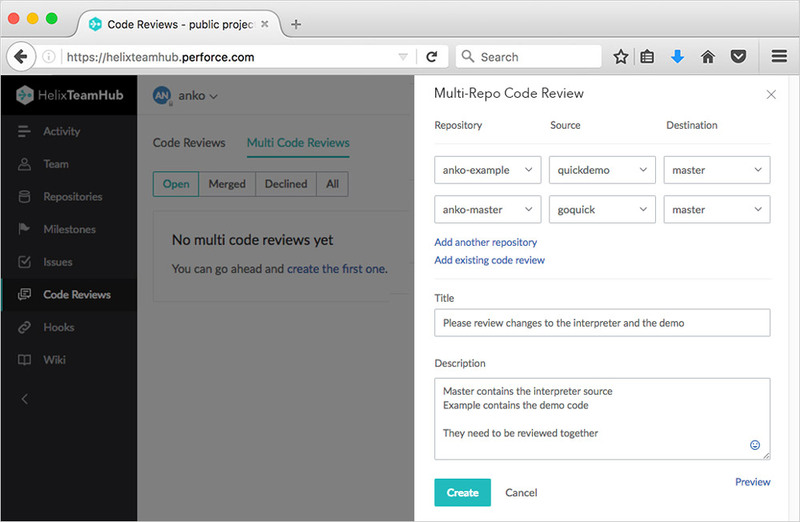 Multi-Repo code reviews automatically ensure changes to code in multiple repositories are reviewed prior to merging. Group commits together and gate your merges by requiring approvals or builds to pass. This helps you manage and trace dependencies across the code base. Track your team’s progress in milestones with our flexible, easy-to-use issue tracker. Use either the list view or Kanban board with easy filter options for a customized “at-a-glance view.” Drag-and-drop to change states or go in-depth to comment and update individual issues. Already using Jira or another collaboration tool? Helix TeamHub integrates with the most popular developer tools. Need a place for developer documentation, project notes, and other information sharing that’s just for your team or project? With Helix TeamHub, you can keep everything in the same place as your source code and other assets. Add unlimited users and unlimited projects. See changes in real time with the side-by-side editor. Look through versions to find the right data. Add attachments and use the markdown syntax to present pictures and charts in the text. Manage large projects with ease. Manage and maintain all your software assets, including build artifacts, under one platform. Create repositories with a couple of clicks, manage their access rights and use any of the build tools you are comfortable with. Helix TeamHub supports Maven and Ivy artifact repositories and Docker container registries. For other binary files, Helix TeamHub offers private file sharing through WebDAV repositories. WebDAV can be used like network share in Windows, Linux, and Mac OSX. Helix TeamHub’s repository and branch-level authorization includes six specific roles and eight privilege levels to keep your projects and code secure. Use regular user accounts and groups to manage permissions. Safely invite external clients and contractors with limited-visibility collaborator accounts, and avoid using personal credentials in external tools with Helix TeamHub programmatic bot accounts that have no access to UI. Helix TeamHub Enterprise is the on-premises Git code management solution that helps you manage all of your Git repositories and projects from a single platform. With TeamHub Enterprise, your CI/CD workflows run faster – without additional tooling or complexity. 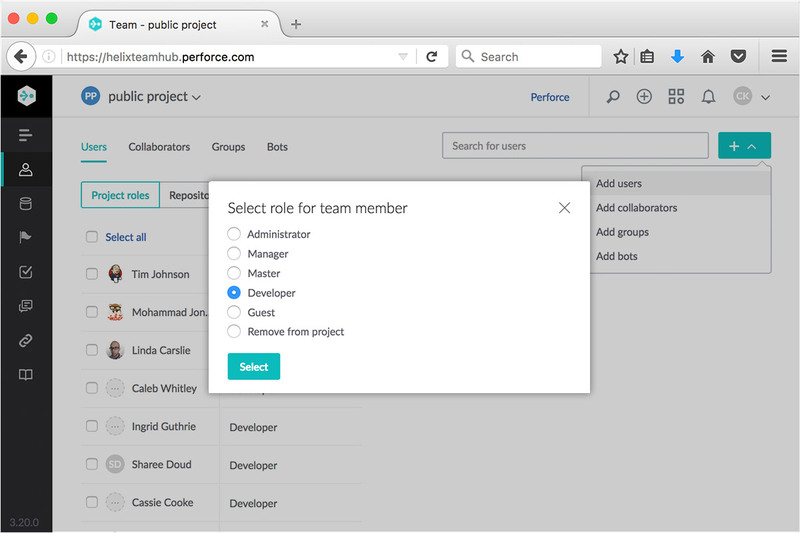 See a live demo of Helix TeamHub in action. Already a Helix TeamHub cloud user?